Continuing its attack on Intel’s high-end desktop chips, AMD on Monday unveiled a third Ryzen Threadripper CPU priced at $549. The Ryzen Threadripper 1900X will feature 8-cores and 16-threads of computing power, but unlike the Ryzen 7-series, which also features 8-cores and 16-threads, the 1900X will slip into the company’s X399 socket. Although some may question the logic of duplicate CPUs, in many ways it makes sense. One of the dings against the 8-core Ryzen 7—despite its great value and performance—is its light-duty X370 platform, which offers only 20 lanes of PCIe for GPUs and M.2 drives. Enter Ryzen Threadripper 1900X, which gives buyers interested in paying for only 8-cores the option of using a heavier-duty chipset. 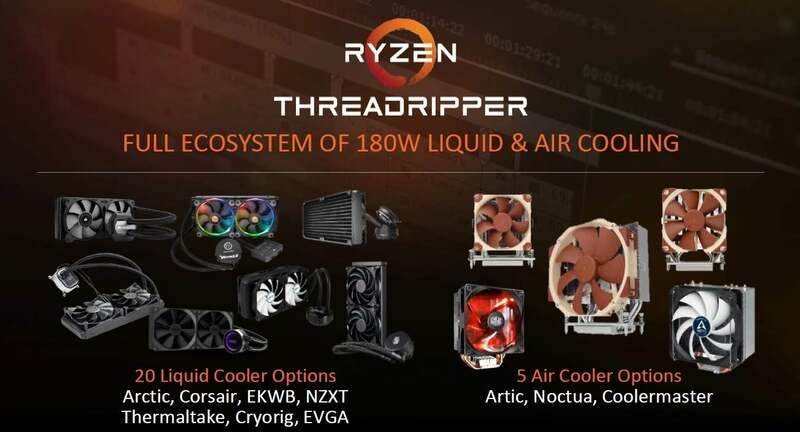 Indeed, Threadripper 1900X supports 64 PCIe lanes, as well as quad-channel memory configurations. Basically, think of the 1900X as the Ryzen 7 for people who want a beefier system. The back of AMD’s Ryzen Threadripper box tells you what the company thinks of its new CPU. “We are not de-featuring it as we go down the stack,” said AMD’s Jim Anderson in a dig at Intel’s practice of turning off features on lower-priced chips. For example, there’s nothing technically preventing the newest Skylake-X Core i7-7820X from featuring the same 44 PCIe lanes of the Core i9 lineup. 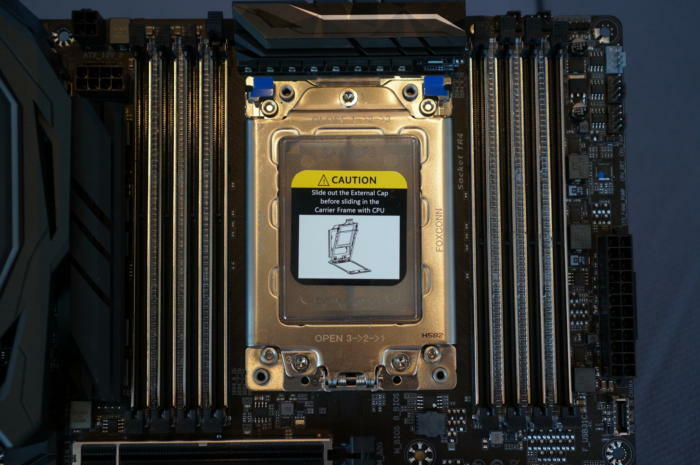 Nonetheless, Intel has artificially limited its 8-core Skylake-X to 28 lanes of PCIe. A confident-sounding Anderson threw another dig at Intel for lowering the price of its newest 10-core chip to $1,000, when the previous iteration cost $1,723. Throwing shade: AMD pointed out what has happened to Intel pricing ever since Ryzen and Ryzen Threadripper have appeared. The Ryzen Threadripper 1900X will have a base clock of 3.8GHz and a boost clock of 4GHz. That’s a bit higher than the 12-core Ryzen Threadripper 1920X, which has a 3.5GHz base clock and 4GHz boost, as well as the 16-core Ryzen Threadripper 1950X, which has a 3.4GHz base clock and 4GHz boost clock. This is the box for the 16-core Ryzen Threadripper 1950X. Besides unveiling the new chip, Anderson also showed several comparison benchmarks that put the top-end 16-core Ryzen Threadripper 1950X running about 55 percent to 15 percent faster than Intel’s current top-end Core i9-7900X CPU. Both chips are roughly $1,000. 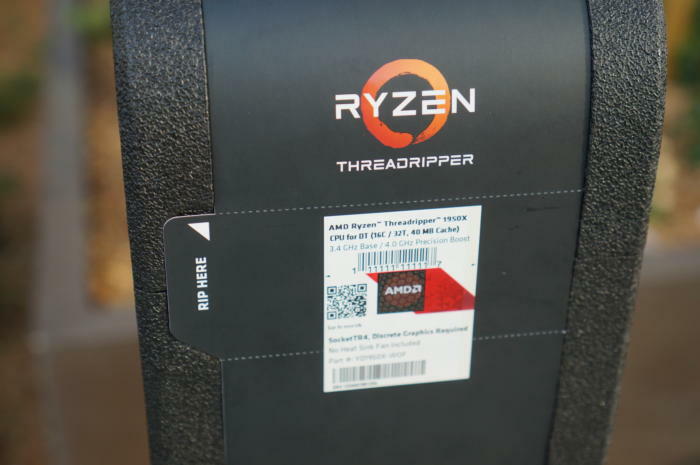 Anderson also said the 12-core Ryzen Threadripper 1920X would generally be faster in multi-threaded loads than the Core i9-7900X, even though it is $200 less. Power consumption of Ryzen Threadripper will also be lower in some tasks thanks to its superior core count. 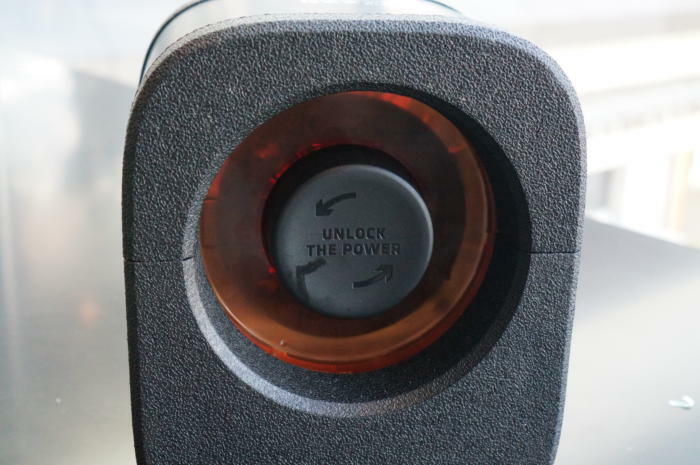 Simply put, Anderson said, the Threadripper 1950X will finish a workload faster than the Core i9, and then go idle while the Intel CPU is catching up. 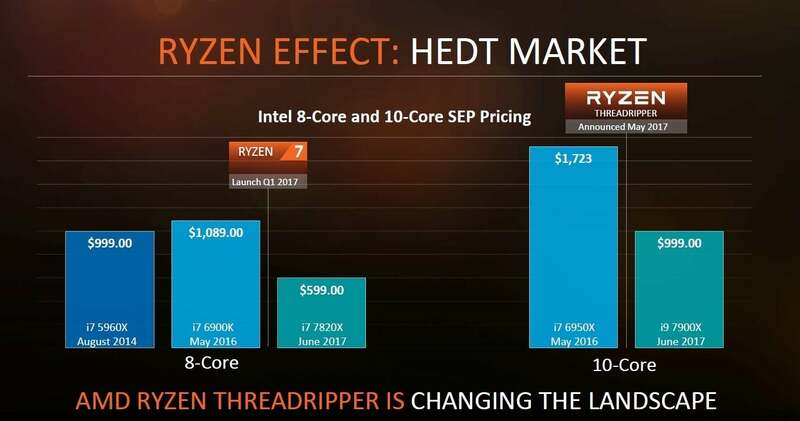 The Ryzen Threadripper 1950X and 1920X are expected to be on store shelves by August 10, with the newly announced Ryzen Treadripper 1900X hitting shelves on August 31. 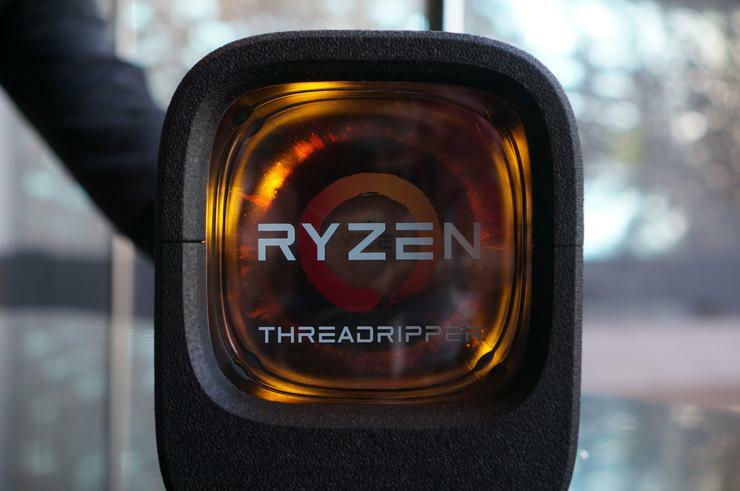 All three chips will come in the recently revealed premium Threadripper packaging, which will also include a bracket adapter for most popular liquid coolers, as well as a torque wrench to properly install the CPU. Chill out: Concerned over lack of coolers for Ryzen Threadripper? AMD says plenty of options will be available and it will include an adapter for most liquid coolers in the box. To show off Ryzen Threadripper’s overclocking chops, AMD showed off a Ryzen Threadripper 1950X with all cores overclocked to 5.187GHz using liquid nitrogen. A CineBench R15 result of 4,122 is enough to break the world record for a 16-core CPU, AMD said. 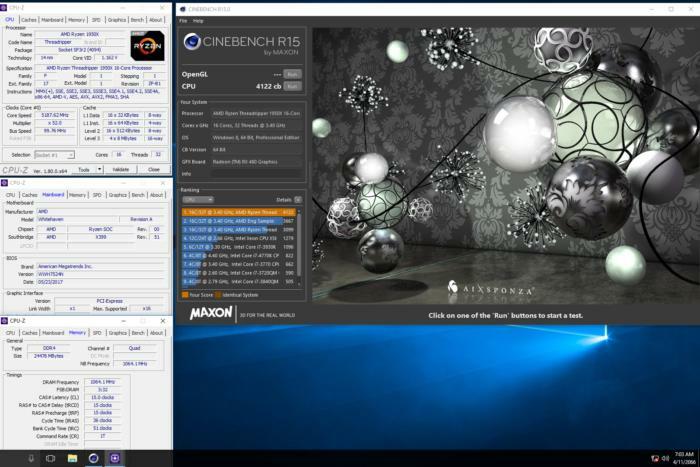 You may not care about liquid-nitrogen overclocking, but AMD’s motivation behind the demo was a shot at Intel, which kicked off the launch of Skylake-X by overclocking a Core i9-7900X to 5.7GHz. Core count eclipses clock speed, though in this one test, its score was “just” 3,181. AMD said a Ryzen Threadripper 1950X being overclocked to 5.1GHz using liquid nitrogen broke the world record. So how will Ryzen Threadripper 1900X do against the competition? Clearly, the CPU in AMD’s sight is Intel’s Core i7-7820X. With a base clock of 3.6GHz and a boost clock of 4.3GHz, there’s a good chance the Core i7 will be on far better performance footing than the higher-end 10-core Core i9-7900X. The problem for the Core i7 is the perceived sleight of “only” getting 28 PCIe lanes. Oh, there’s also Intel’s price. It’s listed at $589 to $599, but the 8-core Skylake-X chip is actually selling well above that at $679. Every Ryzen Threadripper CPU will include a torque wrench with Torx heads to properly install the CPU in the TR4 socket.